The Tourmaster Defender 2.0 2-Piece Rainsuit is redesigned and affordably priced to keep you riding in the wettest conditions when the sky opens up. 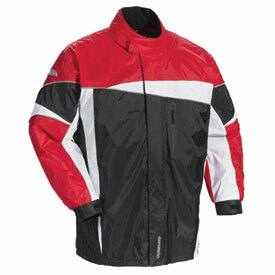 Built with a 100% waterproof polyurethane nylon shell, this jacket and pants combo is easy to store away in your luggage and easy to slip over your riding gear at a moment’s notice. To help manage moisture you get elastic openings, a stowable under-the-helmet hood, a ventilation-promoting inner liner, and zippered underarm vents. Paired with removable suspenders, a dual storm flap, and 3M reflective piping to keep you visible during bad weather, and the Tourmaster Defender 2.0 2-Piece Rainsuit is your go-to-option when bad weather hits.